Last year, one of the coolest things we saw at CES was a mock-up of Kodak’s digital Super 8 camera that recorded to actual Super 8 film. We were supposed to get more details in the spring, and the camera was supposed to come out in the fall. And then the fall came and went and we heard nothing. 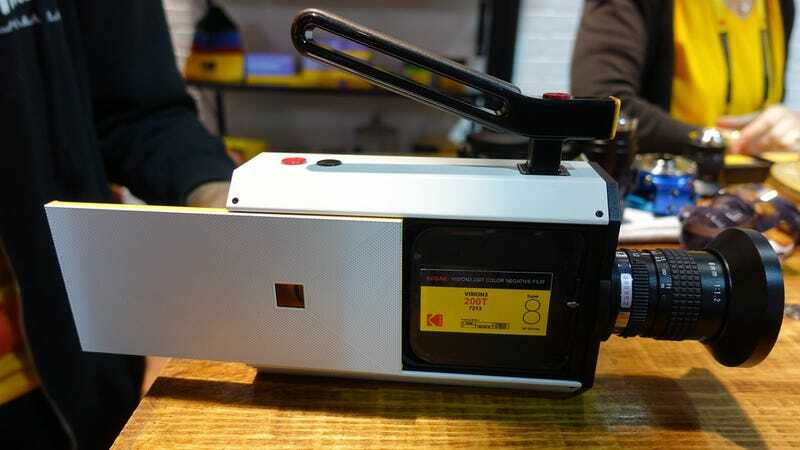 But Kodak promises (really truly), that the digital Super 8 is actually real and is actually going to ship. At CES, the company is even showing off working prototypes, with the goal of having limited edition models out in the May. Just like last year, the concept remains incredibly cool. You’ve got a fully analog film camera that records to Kodak Super 8 cartridges, but with an LCD monitor, an SD card (for recording audio with an external mic) and even an HDMI port for people that want to monitor footage on the big screen. So what was the hold-up? Kodak promised me it wasn’t about manufacturing delays, but that as they heard feedback from potential users, they wanted to add in more features. One of those features is a new scroll wheel that lets you easily choose what speed you want to record you film in the camera and a trigger button on the top for users who want to record while moving quickly. The LCD screen is larger too. The plan for getting your analog footage back from Kodak remains the same. You’ll send your film cartridges for Kodak and tell them what speed you want it processed. They’ll digitize it and send it back to you in a resolution and format that you can use in your favorite editing software. Kodak also announced that it is reviving its color-reversal Ektachrome film for photograph and motion picture. The new Ektachrome film will work in the new Super 8 camera. One thing that has changed from last year is the price. The first model that is promised to ship is a special limited edition. It will be limited to about 2,000 units and will cost $2,000. That’s way more than the $400-$750 promised last year. The non-special edition will be available “cheaper,” but I very much get the sense that it will cost you an arm and a leg. Seeing a working unit makes me more convinced this product will actually ship, but I’m not holding my breath on that May release target.